Do you have a sense of adventure; dreams of a more sustainable and bike-friendly city; and love of community? Find all of that and more at the Bikecitement! Annual Fundraising Dinner and Auction to benefit Bike Works on March 24th from 5 to 9 PM. Bike Works is a Seattle-based nonprofit with a mission to promote the bicycle as a vehicle for change to empower youth and build resilient communities. Since 1996, they’ve worked to make bicycling accessible and affordable in Seattle. Bikecitement! brings together over 500 community members with a passion for bicycling, youth, community, education, access, environment, and social justice. This year, Bikecitement! 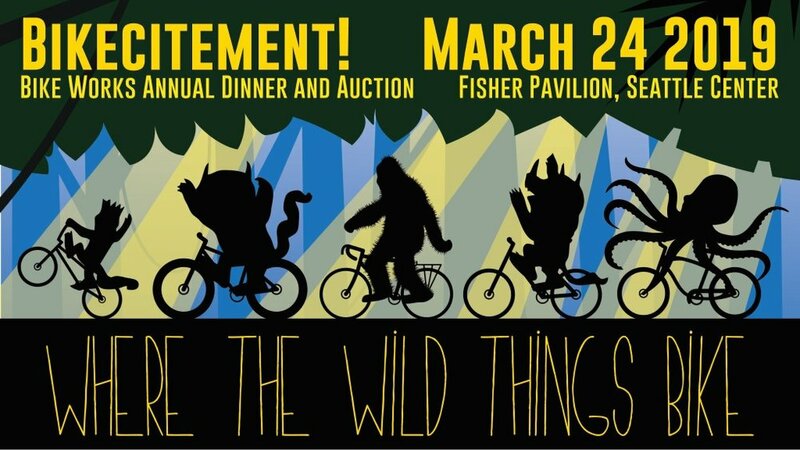 will celebrate the idea that bicycles change lives with the theme, “Where the Wild Things Bike.” The evening will begin at 5 PM with drinks, appetizers, and a chance to show off your fierce self in the Youth in Focus photo booth. Battle your fellow beasties for coveted auction items, from custom jewelry crafted from upcycled bicycle parts, to a night out at some of Seattle’s finest restaurants. Whether you’re looking to ride home on an extra-special bicycle or sip an extra-special beverage, you’ll discover it at Bikecitement! The raucous festivities will also include a delicious, locally sourced meal, beverages, desserts from all over the city, and moving stories from the youth who learn bike mechanic skills at Bike Works. Early Bird tickets are $100 through February 28, and full price tickets sales close on March 15. Act now to join the Bike Works squad by raising a glass (and a paddle) to resilient communities, empowered youth, and a healthy planet. Can’t make it to Bikecitement? Never fear, they accept donations year-round to keep their wheels spinning! Stay up-to-date with rides, events, volunteer opportunities, classes and more by signing up for their e-newsletter and following them on Facebook, Twitter, and Instagram. Special shout-out to the following sponsors for making this event possible: Washington Bike Law, the Bill & Melinda Gates Foundation, GLY, Lease Crutcher Lewis, Recology CleanScapes, the Seattle Department of Transportation, Dave Sharp, evo, Heritage Bank, Vulcan Inc., Conduit Coffee Company, Chinook Book, Eleven Winery, and Flying Bike Cooperative Brewery.